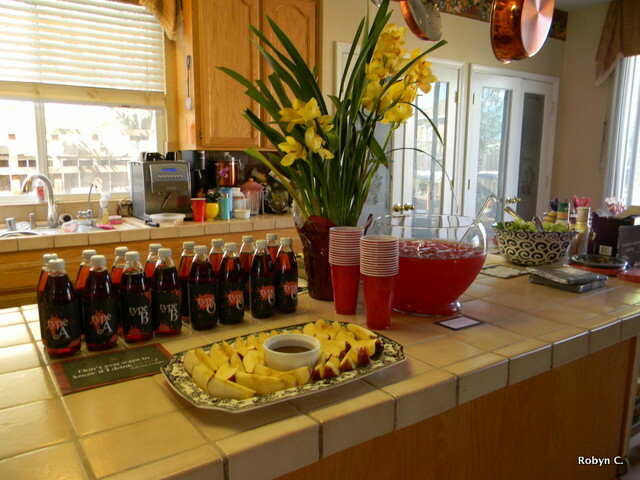 Last Sunday, I co-hosted a Twilight-themed baby shower. I thought it was awesome. The expectant mom thought it was awesome. Therefore, it was awesome. Back story: My friend Shaina is pregnant with her fifth child. When she told me, I realized that she hadn’t met our group of friends until she was pregnant with her fourth child, and we didn’t know her very well then. I happen to think every child – first, second, fifth, tenth – deserves a shower, so I immediately offered to throw her one. Shaina said she didn’t need one, but it wasn’t about need, and she did look like she wanted one. 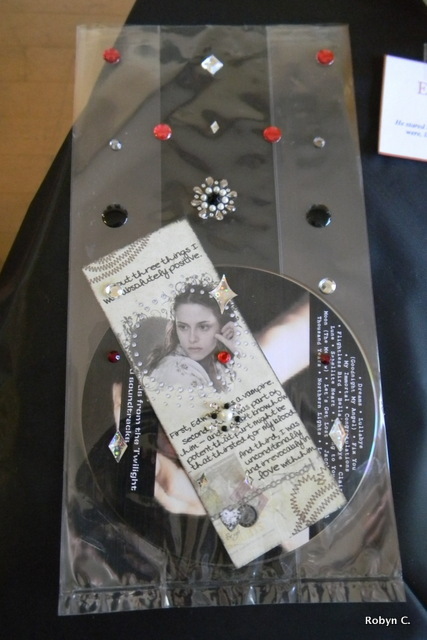 I said something about her sparkling… and the Twilight-themed baby shower was born! 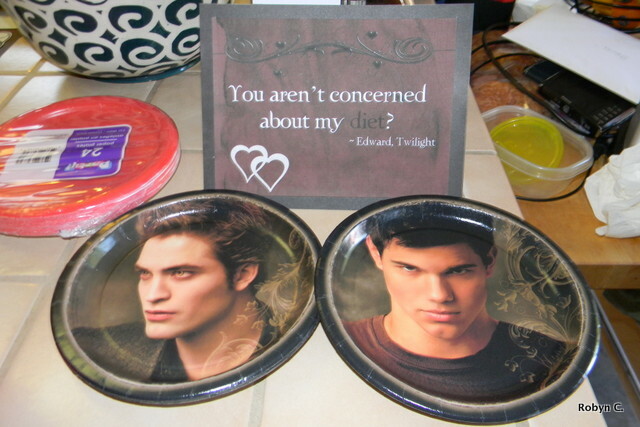 Shaina is far more of a Twilight fan than I am, though I think I’m a little more “squee” about what I do like. So anyway… our mutual friend Liz offered to have it at her house. Shaina picked April Fool’s Day. I joined Pinterest and started planning. 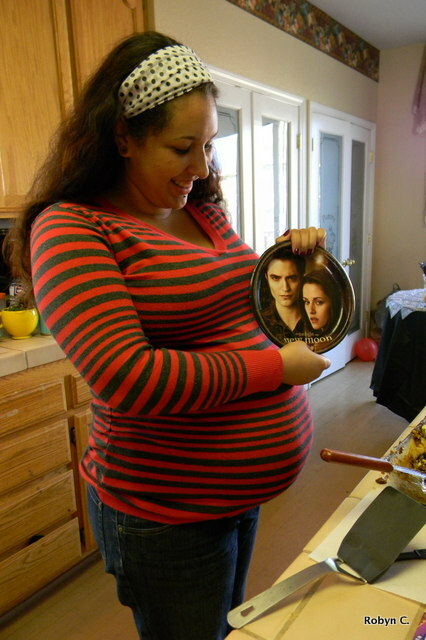 Oddly enough, although there are tons of Twilight party ideas on the web, there aren’t a lot of Twilight baby showers. 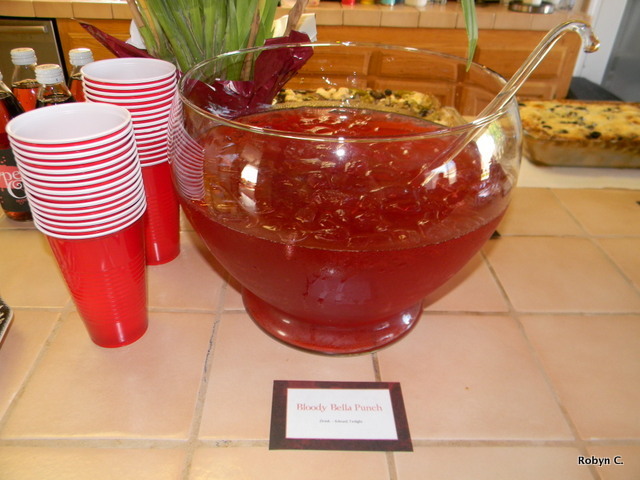 I took some of the movie party ideas and added a few ideas of my own. This blog post is mostly photos of what we did. The fonts are Twilight (of course) and Times New Roman (in which the books are set). The background is from the digital scrapbooking kit Fanpire, by Tangie and the swirls are by Fairytale Studios. 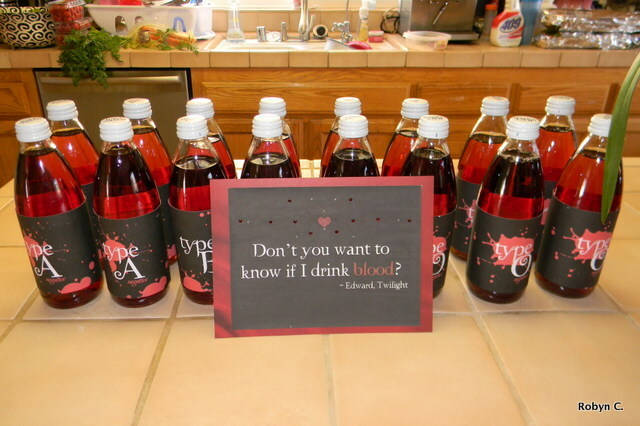 Don't you want to know if I drink blood? 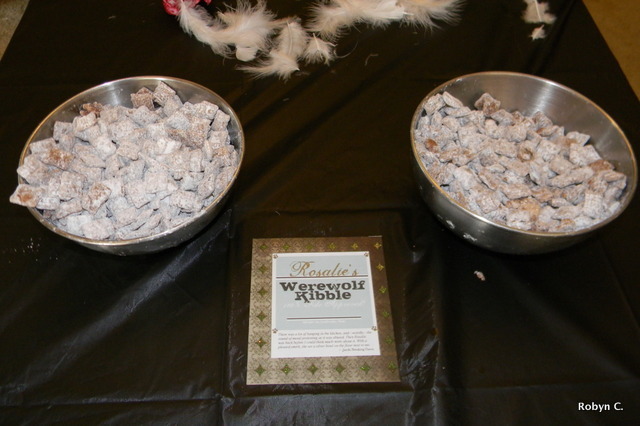 Rosalie's Werewolf Kibble: this stuff is awesome and addictive! Aren't you concerned about my diet? 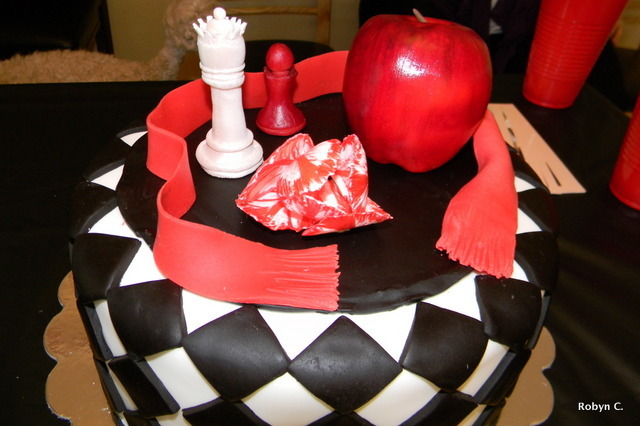 Jen’s cakes are always beautiful and tasty! I tend to go light on decorations in general. Because most Twilight decorations seemed to be for nighttime parties, and this one was the middle of the day, I suppose I went especially light. I just got some red and black streamers for one room. 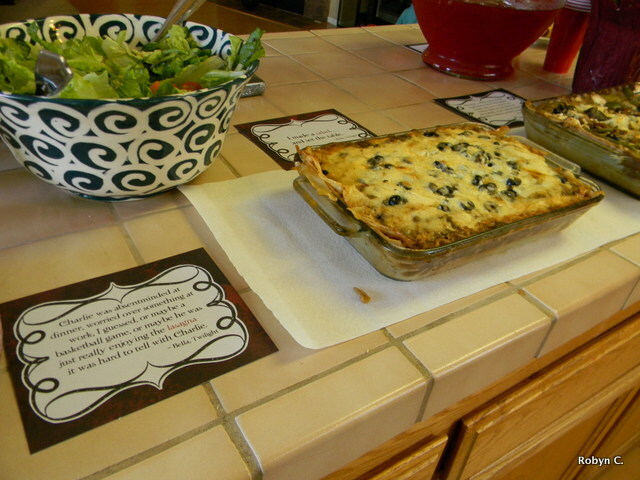 I created a centerpiece for one of the three tables, based on the book covers. 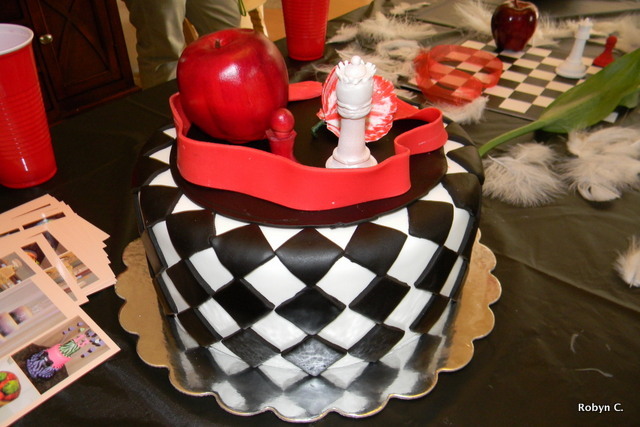 I couldn’t find a black and white chessboard, so the morning of the party, I made a chessboard using cardboard, 12×12 white paper, a Creative Memories square punch, and black paper. 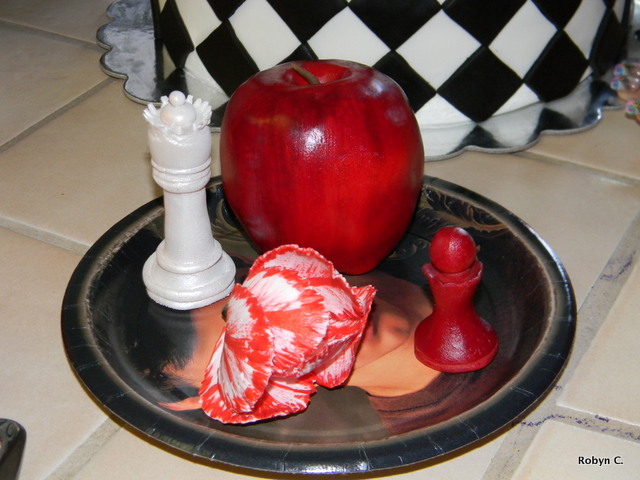 I also couldn’t find black and white chess pieces, so my Dad gave me some extra pieces that I painted white and red. 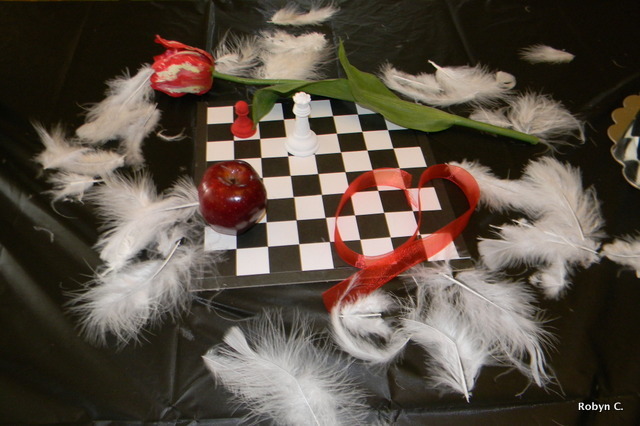 The tulip is a fake white tulip painted red. Ironically, Liz has the “New Moon” tulips in her front yard, growing for real. Her husband offered to let me use one, but they were too pretty to cut. 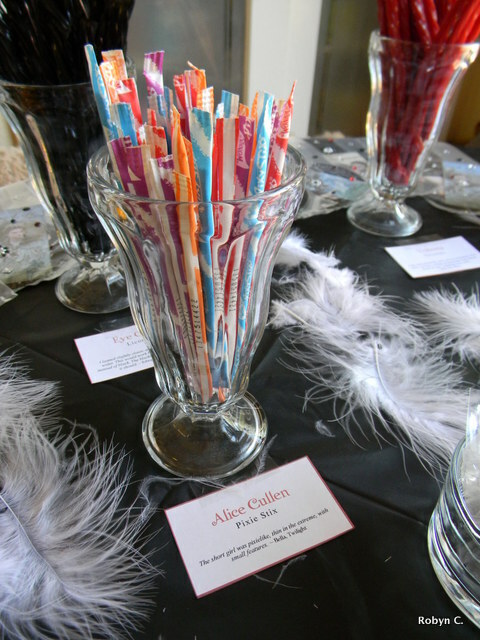 I sprinkled feathers liberally on this table and on the candy buffet table. 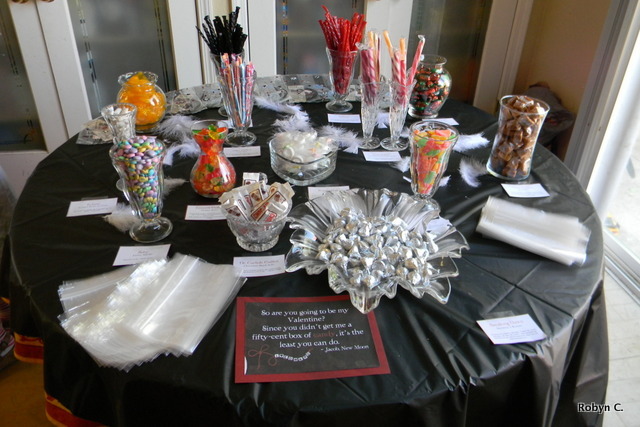 The candy buffet table? Yes! 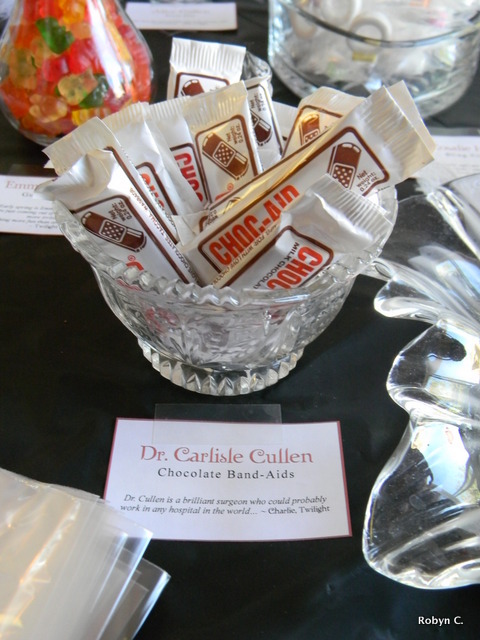 Shaina decided that she wanted a candy buffet as part of the favors. 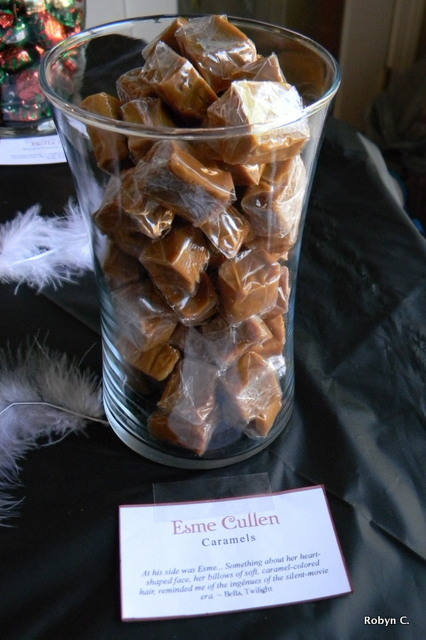 I actually had a lot of fun coming up with a candy for each of the Cullens and Bella. There were also a few random candies, chosen for looks, taste, or both, that I managed to fit in as well. Each candy was put into a glass holder and I typed up quotes to go with all of them. "So are you going to be my Valentine? 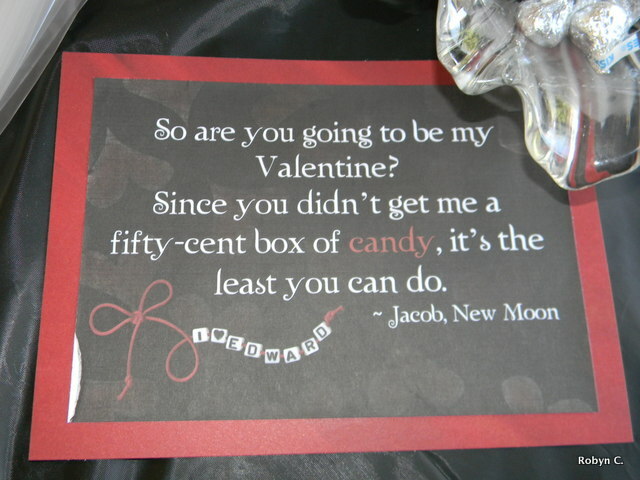 Since you didn't get me a fifty cent box of candy, it's the least you can do." To complete the favors, I printed out bookmarks from Binty’s Designs. I also made a “Twilight Lullabies” CD, because Shaina wanted something baby-related. So I took the “soothing songs from the Twilight playlists and soundtracks” and put them on a CD. Everything was in a clear bag that Jackson and I decked out with sparkles. I almost forgot about the Mini Moose banner. For reasons that are kind of long to explain, Shaina and her family call the baby “Mini Moose.” I saw this banner and created a banner in the same style. Shaina found Twilight-inspired paper at JoAnn Fabrics. I printed large letters in the Twilight font and cut them out. 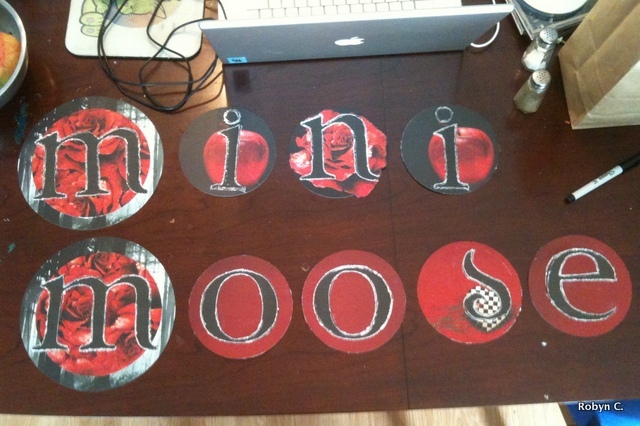 This is the banner on my table – I didn’t get a really good one of it on the wall. 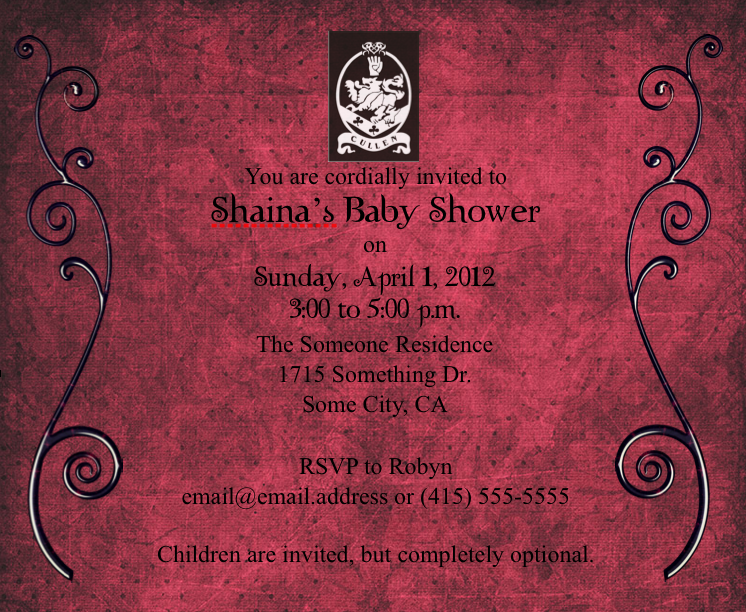 I should probably add a picture of Shaina, huh? Wow, amazing job! You should have been a event planner! I’m not nice enough to be an event planner. That is, I’m not nice to people who are mean to me, and a lot of vendors can be really rude. I like throwing parties though!